Lake Oswego is a beautiful city with wooded areas and forest located in many areas. With this comes risk of human wildlife conflicts. The most common problem we solve is raccoon control in Lake Oswego. Raccoon's can be found in the middle of the woods and also in downtown city areas. They are amazing at adapting to different ways of life and that is why they can be such a pest animal. They have learned to adapt to living with humans, many times living under the same roof. We are able to solve these problems before a conflict happens and always put our customers safety first. 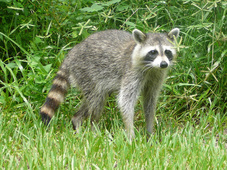 For Lake Oswego Raccoon Control Call 503-201-2432 Today!